Home » Aktuality » Protesters went to the streets of Piešťany for the first time since Velvet Revolution. Marched for Slovakia without GMO. Protesters went to the streets of Piešťany for the first time since Velvet Revolution. Marched for Slovakia without GMO. After almost 25 years there was march held and slogans were heard at Piestany city. 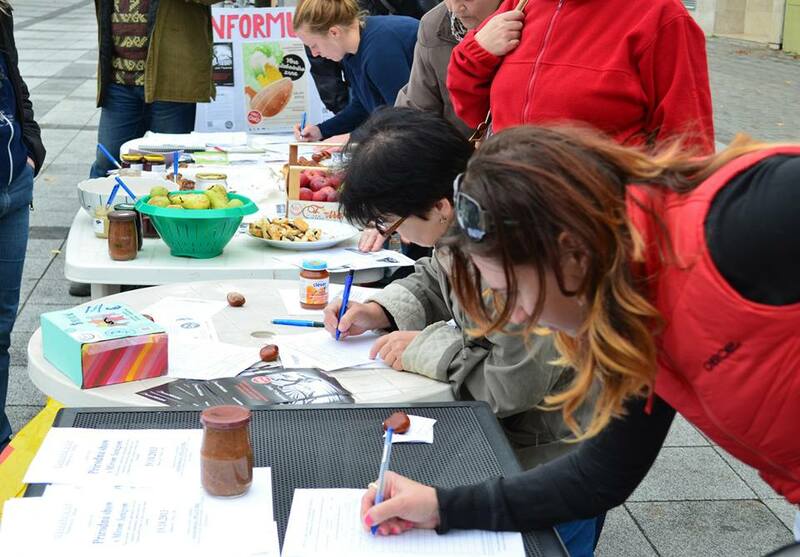 Activists of initiative “PREČ s GMO!” (“Get out with GMO”) organized a public meeting connected with the introduction of petition “For healthy food and Slovakia without GMO” followed by march in the center of Piešťany. 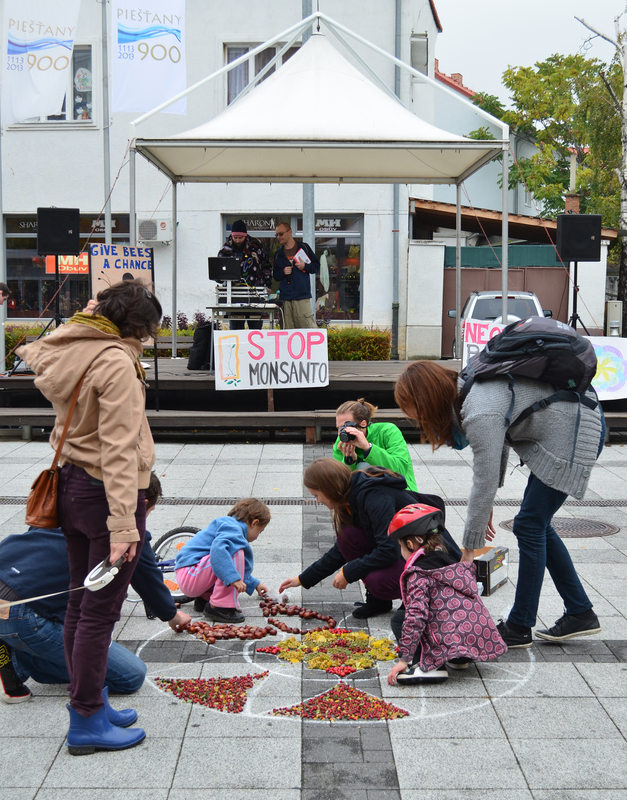 Event was held on the occasion of World Food Day and the global movement March Against Monsanto. Simmilar events were held in more than 500 cities all around the world that day. Slovakia supports the idea twice: there was a march held in Piestany and Bratislava too. Volunteers handed out information leaflets, discussing with passers-by and offered homemade and organic food from community garden of NGO Siet Dobra in Piestany. Performance of Dj Tager, inspirative dances of Vierka and Flower of Life formation of seeds and fruits of nature were a pleasant cultural enrichment for all those present. The main point of the event was an introduction of “Petition for healthy food and Slovakia without GMO” created by initiative Slovakia without GMO. Topics of speakers were activistic, informational, environmental and also scientific. The culmination of the event was a peaceful march through city with transparents. 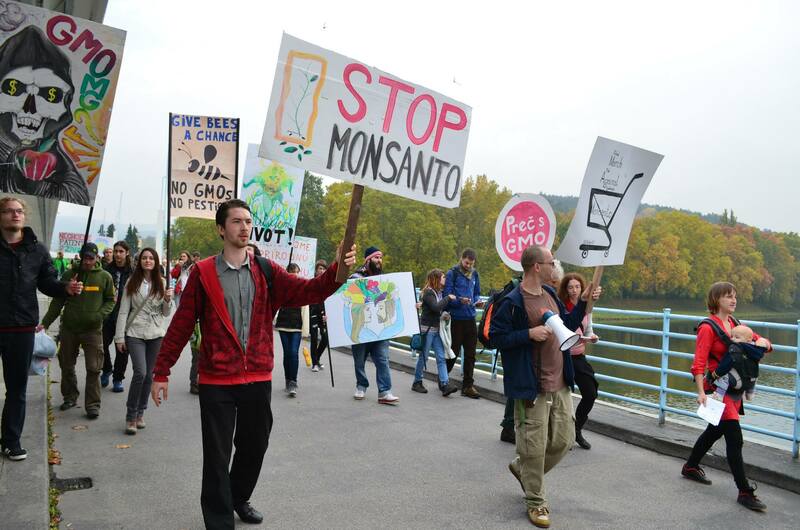 The megaphone resound slogans like: We do not want Monsanto in Slovakia, Slovakia without GMO, Preserve the balance of nature, We want healthy food, Save the bees, We are what we eat..
At the Colonnade bridge demonstrators symbolically threw the seeds into the river Vah. Symbolically creating the “Wave of Free Seeds” and a will to free all the seeds, as a germ of life, from patents of multinational companies like Monsanto is. SPOTLIGHT: Activist just received information about woldwide conference about biotechnologies and GMO directly in Piešťany! They call activists for coordinated reaction to this event www.isbab2013.org.